Nice presentation above on the Airport Metro Connector project, a new transit station that will be located at Aviation Boulevard and 96th Street. 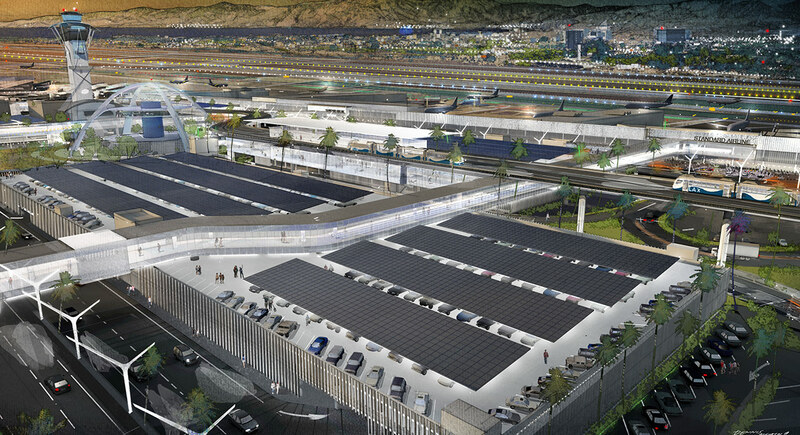 The station will be where riders on the Crenshaw/LAX Line, Green Line and local buses will transfer to the future LAX people mover that will serve the airport terminals. The renderings show the design of the station to date with a lot of work still to be done. Looks good, however, my only question would be growth. A little people mover would not cope with the numbers I suspect will be seen once connected. Use public transportation last year to LAX and even the shuttle bus from LAX/Aviation was leaving people behind then. What does it mean that it’s built separately from the Crenshaw line? Will there be an LAX station in 2019? Is the Crenshaw line station going to have 3 platforms (2 outboard and 1 center)? If so that will really help load those toting luggage. The stairs and escalators to the bus plaza need to be larger. The escalators need to have larger steps to handle rolloing bags.. Also, elevators need to be at least 10′ by 10′. Families with luggage take up a lot of space. To reduce congestion at LAX, I’ve always thought private cars should be banned from the horseshoe terminal area….only shuttle buses, rental car shuttles and hotel vans allowed for pick-up and drop-off. Private cars should drop airline passengers off at a remote location (as discussed in this article) and brought to terminals via a people mover or monorail. In fact, the parking structures within the horseshoe should be used by rental car companies for easy access….similar to other major airports in the U.S.
2-3 minutes?! Good for you los angeles wirld airports…..